Another fine shot from Victor with the following comment which was hand written underneath the photograph. “FOF 269 – Ex. Birmingham Corporation Daimler highbridge ‘sit-up-and-beg’ body. Birmingham no 1269. Operated by Courts of Nuneaton. Interesting information I have come up with for Birmingham 1269 is that in 1949 it received an English Electric H28/26R body from No.765. 765 was a 1935 Daimler COG5 registration AOP 765 with a B R C W H26/22R body but according to my British Bus Fleets 14 – Birmingham City Transport due to war damage 765 was rebodied with an English Electric (M C T D) body in 1943. I am guessing that the (M C T D) stands for Manchester Corporation Transport Department who kind of adopted what Victor calls the ‘sit-up-and-beg’ look. Hopefully someone out there will put me right if I am wrong. With regards Barton 507 which is/was a Leyland Titan PD1 dating from 1948 which had very smart Duple L28/27F bodywork. The reason I use is/was is because there are a few shots of it on the net at various running days so it would appear to have been preserved. Whatever the machinations – and whoever actually built it – that is a Manchester Corporation (style) body. The English Electric body is definitely of Manchester Corporation ‘standard’ pre-war design. The downward curving upper deck windows at the front and side-front are the main characteristics. In Manchester this design was painted in a ‘streamlined’ livery which featured swoops to match the body design features. Coincidently, at a bus group meeting two days ago, I was talking to Trevor Brookes who was the first owner of JVO 230 in preservation. He bought it in the early 1970s, I think direct from Barton, and kept it for quite a few years before becoming an operator himself as Genial Travel of Colchester with rather more modern vehicles. I seem to recall reading, some time ago, that the downward swoop of the front and side windows caused water to accumulate at the four low points and rot the two front pillars. The finished bodies were moved to Manchester for storage and some of the surplus ones sold to Birmingham as seen in the photo above. Thx, David for that info. and photo. It’s amazing what sometimes lurks in the background of photos, but it remains hidden unless someone observant/knowledgeable picks up on it, plus good fortune to see the photo in the first place! Some of these "surplus" Manchester Corporation bodies went on to Arab I chassis, and some went to other operators on unfrozen chassis. Examples were Sheffield, and Newport. The English Electric variants must have been among the last bodies produced by that firm. Alan Townsins work on the utilities outlines most of the detail. David. The photo of the rear of the "Manchester" EEC body is absolutely fascinating! With the Aberdeen tram being a "Preston" product too, could the photo have been taken at Preston do you think, before the trams were delivered and before the Manchester storage occurred? The Sheffield bodies were MCCW and sent to Weymann’s to be finished – making them the only true MCW bodies before 1967. The photograph is definitely at Preston. This photo is part of the English Electric photo archive which I am gradually scanning and putting in my gallery for all to see. There’s some very good stuff in there and I’ll probably end up putting one or two more strategic links on this site in time. I haven’t got the Manchester Bus book in front of me at the moment, but I believe all the English Electric bodies were fitted to either Manchester or Birmingham Daimlers. The ones you refer to were Metro-Cammell bodies, which also went to Coventry and one or two other places. 1269, (FOF 269) was numerically the very last Daimler COG5 delivered to Birmingham City Transport. It entered service along with 1262-1268 on 1 November 1939 and was fitted with one of the twenty English Electric bodies surplus to Manchester’s requirements after most of their order for COG5s were destroyed at the Daimler factory in 1940. 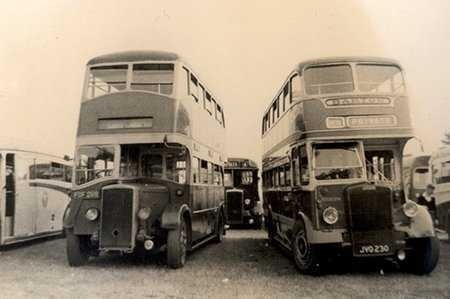 The EE body was fitted to 765, (AOP 765) on 19 May 1943 making 765 the earliest BCT bus to have a Manchester style body. The original body on 1269 was built to BCT specification by BRCW but were not as robust as the more numerous MCCW equivalent bodies. As a result BRCW bodies were disposed of early,with 1269 getting the EE body as a direct swap on 31 August 1949 with 765 going for scrap. 1269 remained in service until31 October 1953 but remained in store until sold on 4 September 1954 to W T Bird of Stratford. 1269 was sold almost immediately to Lloyd, Nuneaton who ran it until January 1956 and then sold it on to Court of Chapel End whom it is with in the photograph. It lasted with them until September 1958 and was sold to Mayfair Garage of Fazeley who broke it up. Nigel. You cannot make that assumption. Crossley, like everyone else, built the bodies to Manchester’s exacting, even quirky, standards. It was almost impossible to tell the difference. [You had to look at things like rain gutters!] It just happened that Crossley occasionally "borrowed" some of these Manchester signatures when building bodies for other operators. According to Paul Collins’s book on Birmingham Corporation, 12 of the 20 ex-Manchester English Electric bodies were fitted to Leyland TD6c chassis, 4 to Daimler COG5s and 4 kept as spares. One of the TDs, EOG 231, whose original body had been damaged beyond repair by enemy action, is illustrated in the book. Another, EOG 215, later turned up with Laurie (Chieftain) of Hamilton, sporting, would you believe, an extremely natty tin front whose postwar Foden-like profile matched those prewar Manchester curves beautifully. There’s a photo on Scran www.scran.ac.uk/ but it will cost you a £10 subscription to see more than a thumbnail. What interests me is where the location could be. We now know that the date is pre Sept. 1958 but did Court’s have any stage services? the vehicle doesn’t appear to have a destination blind. I’ll hazard a guess at Leicester because Bartons reached there with their service 12 from Nottingham and used PD1’s on it but the destination shows Private so then again it could be on a private hire job somewhere. Very interesting selection of surrounding vehicles too, what appears to be a Plaxton half cab body to the left, a single deck COG5 behind, the rear end of a Plaxton Venturer body to the right and a BMMO S type, the presence of that and a Barton in the same picture points me back to Leicester though! Sorry, Chris – I didn’t note the location of the Barton Titan and the Birmingham Corp. Daimler. They are at Kettering, at Wicksteed’s Park, a sort of antediluvian Disney World which it pleased folk to visit from round the Midlands on a weekend during the 1950s and 60s. So – a private hire, as you opined. Wicksteed Park is still going today and is frequently advertised as a ‘day out’ destination in ‘what’s on’ tourist leaflets etc. Have to admit I’ve never been. Ah, the hazards of guessing! but what a fabulous pair of vehicles to use on an excursion or private hire, those were the days!